I get a lot of good feedback from developers who say these posts are helpful, so I don’t feel bad spamming everyone with updates every few months. Developers of CPU-intensive iPhone apps and games can celebrate the continued infiltration of faster hardware, with at-least-3GS-class CPUs in 94.39% of iPhones and iPod Touches. Apps that need high performance can probably start requiring iOS 4.3 (87.8%) to forcefully cut support for the much slower old CPU in the iPhone 1, iPhone 3G, and 1-2G iPod Touches. 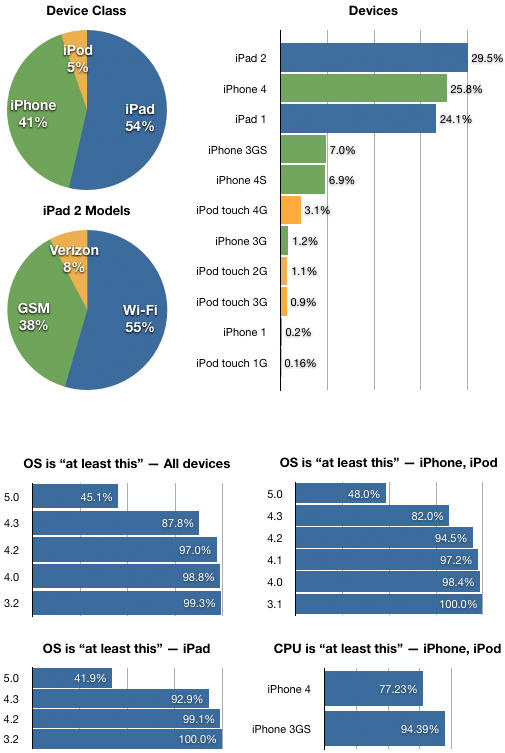 With iPads included, 3GS-or-better CPUs are in 97.4%, A4-or-better CPUs are in 89.4%, and A5 CPUs are in 36.4% of devices in this sample. The iPhone 4S has sold well so far, especially given that it’s only been out for 47 days. iPad 2 sales have been steady, but seemingly not mind-blowing. We’ll see what happens after the holidays: last year, I saw a huge rise in iPad sales on Christmas and the following few days.